This year's Fairtrade Fortnight is about generating awareness on how, as consumers who buy many exported items every year (possibly without realising where exactly those items have been made) we can tip the balance of trade in favour of poor producers by choosing fairly traded goods. The launch event for the fortnight is to be held at the Riverside walkway on the Southbank SE1 on Sunday 22 February from 11am to 4pm. It's a free, family event where anyone can compete in the programme of events to win a Fairtrade Chocolate Medal. Chocolate's a good enough excuse for me to compete! Their will be loads of Fairtrade products on offer including some tasty treats that you could help create - how does making a fairtrade smoothie using your own pedal power sound? 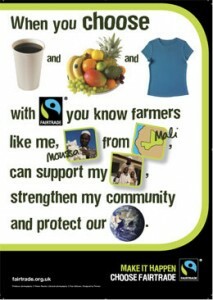 For more information visit Fairtrade Fortnight.